In Malgorzata Bany’s practice, the reproducibility of the moulding technique and the uniqueness of the hand-carved form sit side by side. For the past half-decade she has experimented with cast, carved, and worked forms that consistently blur the boundaries between sculpture and design, combining utilitarian functionality with the principle that objects must stand on their own terms. A common material in Bany’s practice is Jesmonite, a gypsum- and resin-based casting medium invented in the mid 1980s to unite the immediacy and lightweight flexibility of what were then comparatively new mediums such as fibreglass, with the durability and strength of concrete. Her approach to the material has been one of insatiable experimentalism, pushing at its aesthetic and functional capabilities as well as its formal potential. Developed recently in collaboration with Faye Toogood is a series of desktop objects cast solely in this material, including bookends, paper weights and trays. Their pristine surfaces and planed, planted forms have an anchored permanence akin to scholar’s rocks, ancient omphaloi and standing stones, or the Millau Viaduct. In their simplest states they read as abstract, statuesque forms, but when loaded with the accoutrements of the home elegantly take their places as fully functioning creative aids. Occasionally, subtle inflections of colour or tone fused into their surfaces serve to remind us that these are active agents, three-dimensional punctuations with – at times – incredibly painterly tendencies. And all of this in the form of small-scale, table-top monuments. Though Bany has in recent years focused increasingly on the principles of design, her fine art practice continues to exert itself on her navigation of the field. This is particularly exemplified here by her wall-bound compositions, as well as objects that feature series of components or adjacent, juxtaposed, and interlocked parts. Yet even in these instances, typically incorporating materials such as shaped pine and plywood alongside the cast elements, the aesthetic characteristics of casting media still have their influence. Every element is meticulously finished with a perfecting layer of white gesso. The result is a purified theatre of objects whose surfaces have an obdurate and insistent purity. Lips and cusps of material, sharp returns, and crisp, shadow-catching edges seem to have something instantaneous about them; they curve weightlessly upwards, to support an ovoid prop, a shallow bowl with the potential to ring out if struck, or just their own volumes, like the delicately taught surfaces of oil drops on water. These are poetic tendencies, but they are simultaneously grounded by forms that appear almost weighted, anchored in their footprints. Considering Malgorzata’s Polish heritage, it is striking that her work draws on a strongly and academically English aesthetic idiom. Like Ravilious, Moore, Hepworth or Nicholson, artists whose influence runs in dense seams throughout her work, the subtle texturised surfaces that she riffles into cast forms evoke the chalk, flint, and limestone beachscapes of the English coastline; to the time-based effects of erosion, decay, and the action of the sea on its sedimentary deposits. Alongside these themes are more subtly driven probings into the restrained optimism that defines our island’s post-war climate of architecture and design, with its mandate for aestheticised utilitarianism and social experimentation. Unsurprisingly, the artist also takes influence from Japanese aesthetics, including the meditative and ritualising forms of rock-carved Tsukubai, a type of hand-washing basin defined by its intense celebration of the contact between water and stone. Uniting all the objects brought together for this exhibition, and indeed all of Bany’s practice, is an intensive and meticulous approach to the handmade. Even where moulds are used, the artist painstakingly carves them out by hand with volumes and forms gouged from their negative interiors, before finishing them with a variously smoothed or texturised surface. It is an intuitive process, exploring serendipity through a sculptural process that only allows the final object to be revealed once the casting material has set and the mould removed. Bany lives and works in London. From 2007 to 2010 she studied at the Academy of Fine Arts in Warsaw before moving to England, where she completed her BA studies at University College Falmouth followed by an MFA at the Slade School of Fine Art in London, graduating there in 2014. In the same year she was awarded the Desiree Prize for Painting, and was nominated for the Adrian Carruthers Studio Award, a scheme run collaboratively by the Slade and Acme Studios. She was recently nominated for the Officine Panerai Next Generation Designer Award as part of the Wallpaper* Design Awards 2018. Exhibitions include mixed shows and collaborative projects at TESTBED 1, London (2012 and 2013), Milan Design Week (2014), Etage Projects, Copenhagen (2015), the London Design Festival (2015 and 2016) and The Trade Show presented by Faye Toogood, London (part of London Design Festival 2017), among others. After goldsmiths’ work, tapestries and embroideries were among the costliest works of art in the Middle Ages, due to the precious materials and the countless hours taken to produce them. Whether hung on the wall or worn, textiles provided a potent display of their owners’ wealth and status. Their vivid decoration also provided the perfect backdrop for courtly pageants, royal ceremonies, and liturgical festivals. This publication, the first of its kind in many decades, draws together thirty-six rare and sumptuous European textiles created between the late fourteenth and late sixteenth centuries, which together encapsulate the incredible breadth of Europe’s flourishing textile industries during the period. Incorporating objects made both for secular and liturgical use, it explores the contexts of their creation, their functions and purpose, and their changing fortunes over the course of the subsequent centuries. The publication was released to coincide with an exhibition held at Sam Fogg, London, from 14 June to 13 July 2018. It was co-written with Dr Rosamund Garrett, Associate Curator of European and Decorative Art at the Brooks Museum, Memphis. An exhibition showcasing masterpieces of medieval art across a wide range of media, Of Earth and Heaven: Art from the Middle Ages took place at Luhring Augustine Gallery in New York, from 27 January to 10 March 2018. The accompanying publication, beautifully designed by Richard Ardagh Studio, draws on influences as diverse as pre-war monographs on German Renaissance sculpture, Modern British art reference books, Blackletter typefaces, letterpress printing, and the tradition of tipped-in image plates. It was shortlisted for the PrintWeek Awards 2018. The centrepieces of the exhibition were three monumental sections of carved stonework from the south transept window of Canterbury Cathedral, one of the most important pilgrimage sites in Europe. The window was designed by Thomas Mapilton (d. 1438), a master mason who worked on Westminster Abbey and the Tower of London prior to his appointment at Canterbury. Made from limestone specially quarried at Caen in Normandy in 1428, Mapilton’s window was one of the most ambitious projects of English Gothic architecture in the whole of the medieval period, filling almost the entire height and width of the cathedral’s vast south transept. The exhibition also featured a carefully selected group of paintings, sculptures, and goldsmith’s work that underscore Europe’s artistic flowering between the twelfth and early sixteenth centuries. Highlights included an extraordinary stained-glass window depicting the Creation of the World and the Expulsion of Adam and Eve from the Garden of Eden, painted in 1533 by the celebrated Renaissance glass-painter Valentin Bousch and now one of the centrepieces of the Hill Art Foundation. Among the smallest-scale objects presented were a precious 13th-century Limoges reliquary chasse, a silver arm reliquary made in Auxerre in the 1530s, and a pristinely preserved gilt-bronze corpus of Christ, cast by a master goldsmith in Cologne, in around 1180. 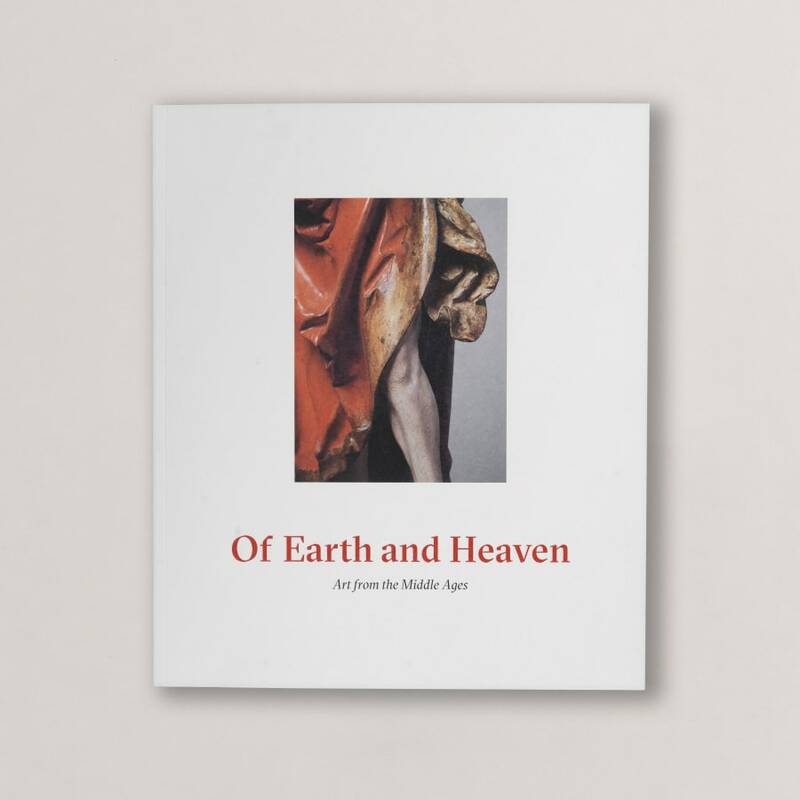 Of Earth and Heaven: Art from the Middle Ages is available to buy here. Published in conjunction with the exhibition ‘Maiolica before Raphael’ held at Sam Fogg between 8 May and 16 June 2017, this publication brings together an important group of late-medieval and early Renaissance ceramics made in Italy between around 1275 and 1500. Later Renaissance istoriato, or narrative, maiolica, produced in the orbit of Raphael and other Italian artists, is widely known and has been extensively studied. But not for a hundred years has the same level of attention been focused on the magnificent works that preceded it in the fourteenth and fifteenth centuries, which were at times prized by contemporary patrons more highly than precious metals. Maiolica before Raphael refocused the spotlight of contemporary scholarship onto the development of Italian maiolica from c. 1275 up until 1500, centring on the key period of development in the Quattrocento – the age of Donatello, Mantegna and Botticelli. Presenting forty-three rare objects from the foremost centres of production that have survived in private hands, this catalogue explores the spread and evolution of the medium, as well as the history of collecting and the changing taste for Italian pre-Renaissance pottery in the modern era. Co-written with Elisa P. Sani and Justin Raccanello, with a preface by Timothy Wilson. 200 pages, 60 colour illus. The Moirai, or Three Fates, have been re-manifested in European history numerous times, evolving from Antiquity through Pagan and later Christian contexts, and into an increasingly secular, existential vein. Petrarch’s late Trionfi poems, in which the Fates feature as the third of six ‘triumphs’, offer a strongly rooted humanist point of contact with the cultural and societal questioning of death. 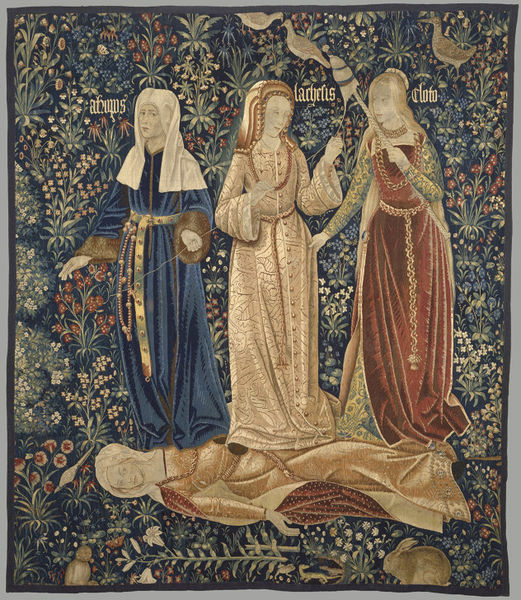 The same removal from religious significances is expressed by visual art from the later Middle Ages, such as on a large-scale tapestry panel now in the Victoria & Albert Museum in London. Here the Three Fates appear in late fifteenth-century courtly dress comprised of richly brocaded fabrics gathered with golden chains and died leather belts, and they stand on the no-less-beautiful figure of Chastity lying across the lower registers of the panel against a background of mille-fleurs. At some point in its history, of course, the tapestry was removed from its original context, elided from its intended location and from the larger work from which it originates. Nevertheless this was courtly rather than spiritual art; It no longer relies purely on religious symbolism or ideology – the need to be a devout and goodly Christian – but instead communicates a religion of humanity, based on the desperate need to make each day count towards the enlightenment of our so-called civilisation, and the happiness of our closest relations, as we hang delicately from the fine thread of existence. The visual pun offered through a depiction of worked thread in the medium of a woven textile would also have injected the imagery of this tapestry in particular with incredible humour, of a type well-understood by elite medieval audiences. But, it plays too on the inevitable fate – and control? – of the tapestry weaver (as a representative of human craft more generally), that with the steady manifestation of the woven image their life and ours is being counted off. Time marked by the weaving process in this way ties the V&A tapestry (and others of its type) directly back to Penelope, sitting at her golden loom and structuring her denial of death in gilt thread. Obsessively questioning, and acutely sensitive to pathetic fallacy, Francisco de Goya y Lucientes places his own version of the three demonic Fates in a human vortex, spinning over a burnt and barren landscape chillingly darkening before our eyes. His experience of their allegorical significance was both universal in its fear, and very private in its intended audience, communicable only to himself as he painted the figures a fresco across the walls of his own house. A tiny, globular manikin-like figure appears as if squeezed dangerously by the grip of Clotho (reminiscent perhaps of Fay Wray in the hands of the villainised Kong), not spinning but extracting the desperately short thread of life from its navel. Scholars have found great difficulty interpreting this picture because of the unusual presence of a fourth figure at the very front of the floating group, with a face that bears no obvious relation to the Fates or their prey, Chastity. Interpreted by some as Prometheus, who was left bound on a mountain peak to be disgorged by eagles in recompense for stealing fire from Zeus, its overriding effect is one of tethered awkwardness, of writhing limb-locked captivity. We should be careful not to romanticise this figure, seemingly male within an otherwise all-female grouping, as a representation of Goya himself. Nevertheless, it may have manifested (to the artist’s introverted mindscape) a personal, human reality caught between the sisters as they run their haggard hands roughly over life. In contemporary visual culture, artists diverse have utilised death (and Death) for both their medium and their message (it is pretty hackneyed to bring up Damien Hirst but he is ineloquently obsessed by the subject and is foremost in the public eye amongst his generation of artists). Yet often woven through their work are the shadows, revisions, or even wholesale reuse, of the elegiac figure types of the Three Fates, appropriated as they have been for millennia to cut at the quick of our limited time on the Earth. Gilded Light: 16th-century stained glass roundels from the collection of Sir Thomas Neave and other private collections, an exhibition that took place at Sam Fogg, London, from 1 to 8 July 2016. This exhibition, the first of its kind in London for over a decade, brought together over 35 stained glass roundels and panels of other formats, the majority of which were made during the first two-thirds of the sixteenth century when the art-form was at its zenith. The core group of roundels featured in the exhibition were brought together in the early 1800s by one of the most important early-modern connoisseur collectors of Medieval and Renaissance stained glass, the second Baronet Sir Thomas Neave of Dagnam Park (1761-1848). An avid enthusiast of European artwork, and particularly of glass, Neave was one of the first private collectors to amass a collection of high quality stained glass from the Low Countries, purchasing many of his pieces directly from dissolved monasteries and foundations, or through agents such as the German cloth merchant John Christopher Hampp (1750-1825) who settled in Norwich and traded with Flanders throughout his career. Much of the Neave collection was destroyed by ordnance and fire damage over many years, or has subsequently been dispersed; some of those panels formerly in his collection and that have survived can today be found in the Victoria & Albert Museum, London, the Burrell Collection, Glasgow, the Metropolitan Museum of Art, New York, and in English churches endowed by the Neave family. His family seat, Dagnam Park in South Weald, Essex, was demolished in 1950 and the remains of his glass collection dispersed by his direct descendants. Characteristic of Sir Thomas Neave’s taste and acute eye for detail and quality, the group of roundels presented in this exhibition mark a vivid and breath-taking high point in the medium. The exhibition was accompanied by a fully illustrated catalogue, now unfortunately sold out. In January of this year I had the privilege to work with three astounding Art Historians, Nicholas Herman, Anna Koopstra, and Nicola Jennings, on a publication entitled Late Medieval Panel Paintings II: Materials, Methods, Meanings. The book is edited by Professor Susie Nash and published by Paul Holberton, to accompany an exhibition mounted by Sam Fogg and held at the gallery of Richard L. Feigen, New York, from 22nd January to 22nd February 2016. The book, the second volume in a series on the subject, presents a series of in-depth studies of late medieval panel paintings, as well as one tapestry, made between 1400 and 1530 in Spain, Germany, Austria, France, and the Southern Netherlands. Many of the objects examined are new to scholarly attention, offering steps forward in the discussion and analysis of medieval works of art, and significant insights into the artists and patrons of the period.